Dezeen promotion: Forbo has launched Mamoleum Marbled, a new collection of marbled lino floor coverings designed to help create homely interiors. The range was designed in response to the growing trend for interiors with a "lived-in" aesthetic, which can create more relaxed environments that contribute to well being and productivity. "A trend that is increasing in popularity is the 'lived in' look, which emphasises the move towards de-formalised environments,"explained the manufacturing company. "Designers are breaking down the pre-conceived conventions by juxtaposing seemingly disparate materials, finishes and styles to create more fluid spaces,"
"In fact, much thought is now being placed on the design of health care environments that have a ‘homely' feel to encourage patient healing and within workspaces," it added. "Designers are maximising softer, non-corporate designs and providing flexible space for communication and collaboration to support their clients' efforts to reduce workplace stress and improve productivity." Real is the largest range in the collection and combines "warm neutrals and calm greys"
Mamoleum Marbled comprises five different styles, with each blend a "multitude of shades" echo the colours of natural landscapes. 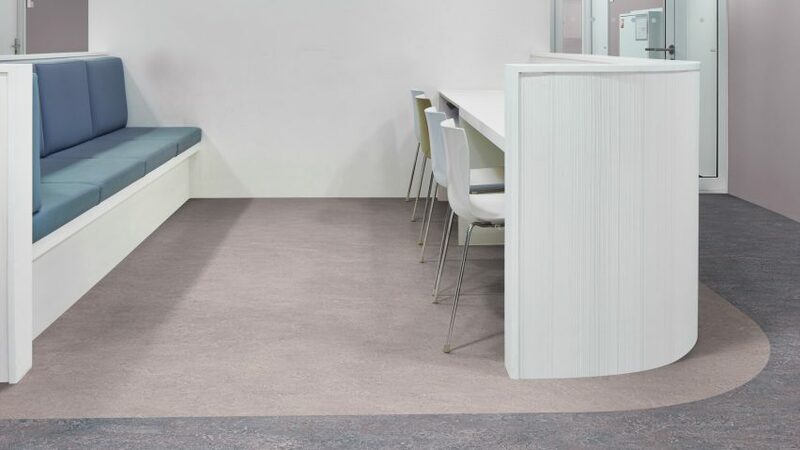 Referred to by Forbo as "chameleon-like", this makes the range suited to a range of spaces as it can unite disparate zones within the interior, seamlessly linking different colours, materials and patterns. "As the flooring is one of the biggest surface areas within an interior, it has a huge part to play in the overall balance, so choosing a material that can morph and adapt to its surroundings is crucial," said the brand. The first style, Fresco, has a soft marbled look with subtly blended tone-on-tone shades that create a balanced aesthetic. Real is also minimal, "combining warm neutrals and calm greys", but is characterised by several different colour tones. In contrast, Vivace is the liveliest blend, manufactured from six to eight different colours. The fourth style, Terra, has a "small-scale" marbled structure inspired by igneous rocks, while Splash is designed to appear light grey from a distance, but is speckled with a variety of colours when viewed up close. Mamoleum Marbled is manufactured almost entirely from natural raw materials including linseed oil, rosin, wood flour, jute and limestone, making it "one of the most sustainable floor coverings available on the market". Mamoleum Marbled is independently Environmental Product Declaration confirmed as a carbon neutral floor covering in the manufacturing phase of its life cycle. To find out more about the collection, visit the Forbo website.